Robert (Bob) Pratt, a well known local businessman and amateur historian had the idea to form a Society to provide a forum for all those interested in the history of transport. Bob had already been involved in the formation of two local historical organisations, the Suffolk Photographic Survey & the Suffolk Local History Council (both are accessible via Suffolk Local History Council link). Bob assembled a small group of local transport enthusiasts who formed the Ipswich and District Historical Transport Society in 1963 to cover transport by air, road, rail and water. The initial format of monthly meetings, with the exception of June, July and August, has continued almost unchanged until the present day. The meetings are addressed by invited locally and nationally known speakers. Visits are also made to local venues of transport interest. The Ipswich and District Historical Transport Society publishes a quarterly newsletter 'Transport Matters' (ISSN 0306 0187), this publication includes accounts of lectures given and articles on transport subjects. In order to comply with the above legislation we need members’ permission in writing to use your personal details, such as name, address, e-mail etc, for club purposes. To achieve this a form has been created. EVERY MEMBER will receive 2 GDPR forms BOTH to be SIGNED-1 to be returned to Treasurer Pat, the other to be retained for your own records. 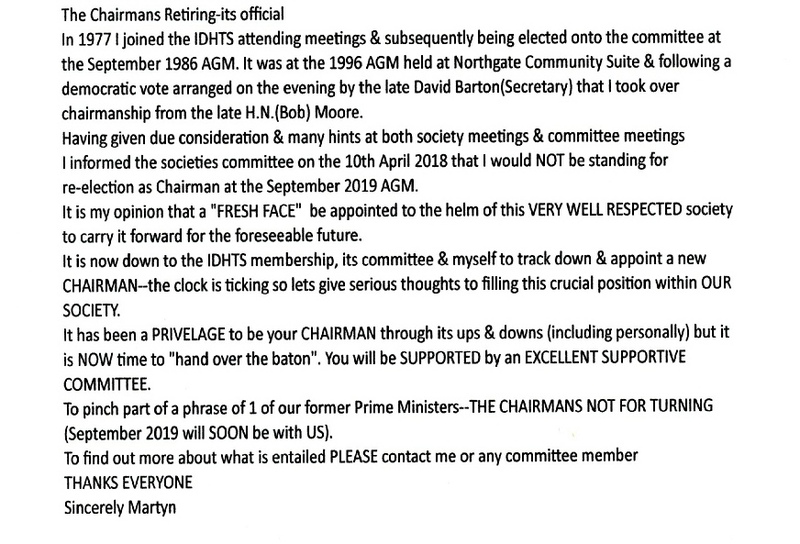 If you don’t do this we cannot use your details to contact you so you will be deemed to no longer be a member of the IDHTS. Click on this link for the form. The Committee are pleased to announce that David Kerridge has been appointed Society Secretary with immediate effect. Additional car parking is now available adjacent to the Salvation Army premises at the HiQ car centre by kind permission of the HiQ manager. Afternoon Excursion in ex-East Kent AEC Regent Bus to Deal (coastal/country route) – time for a cuppa, walk, & visit to Deal/Walmer Lifeboat…or a dip in the sea!! !